The parafoil kites you see in the air at kite festivals can be of the single, dual or quad-line variety. These are soft kites, meaning there are no rigid spars in their construction. Most commonly, the quad-line kites you see down at a beach or at a festival will be surfing kites, as they tow surfers through the waves and even into the air from time to time. Most parafoils are not easy to re-launch from water, so are not used for surfing. Single-line and dual line parafoils are flown over the sand and we have seen too many of these at the local festival to remember them all! Very few of the parafoils you see will be home-made though. Even a simple one is relatively complex to put together, compared to say, a simple Diamond or Sled. Making The MBK Parafoil is a PDF e-book. This means you can download it then print it off if desired. Single-line. Relatively flat kites, often with multiple small keels to which the bridle lines are attached. These can look a bit like a flying inflatable mattress! Also, there are novelty kites that are technically parafoils, but come in all sorts of creature shapes and sizes. Dual-line. Fast, highly maneuverable stunt kites which pull hard and are flown from a stationary position. Although soft in construction, you still wouldn't want to be hit by one of these, in windy weather! Quad-line. 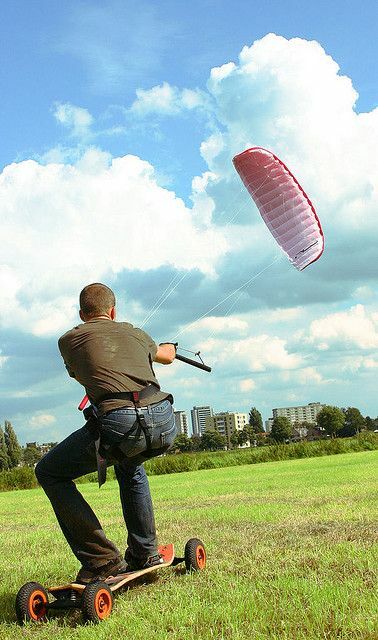 Traction kites, meaning designed for pulling buggies, mountain boards, or even a pair of in-line skates! Two lines are used for steering, while the other 2 are brake lines. See if you can identify some of the above types in the listing below! Two colorful single-line parafoils, with twin tails. 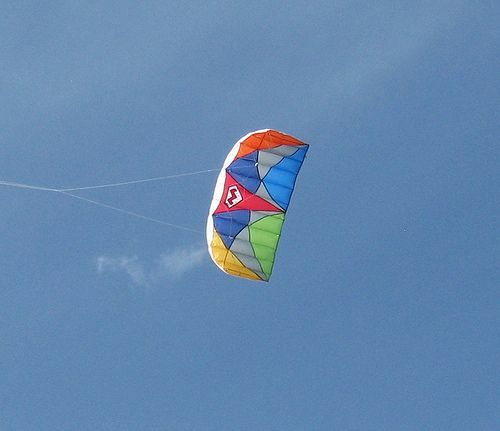 The flat-looking design with multiple small triangular keels is only seen in single-line kites. We've seen a variety of these at our local kite festival. Some can be quite large, requiring a large bag of sand as an anchor or even the tow-bar of a vehicle. Simple and bold graphic designs suit these kites best, since the 'canvas' is not exactly table-top flat when you get up close! 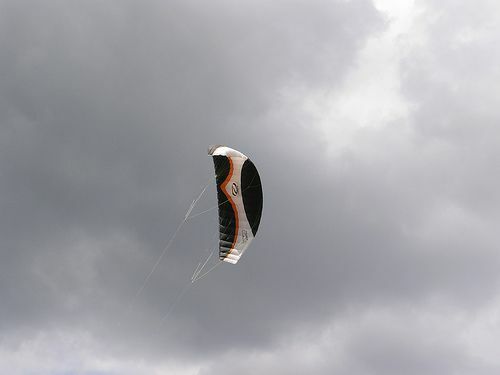 Some small soft stunt kites can be flown in a single-line configuration, like this one. See how the 2 main bridle lines are attached near the wing-tips with shorter lines, like a 2-line stunter. However, both bridle lines come together at a single flying line attachment point. 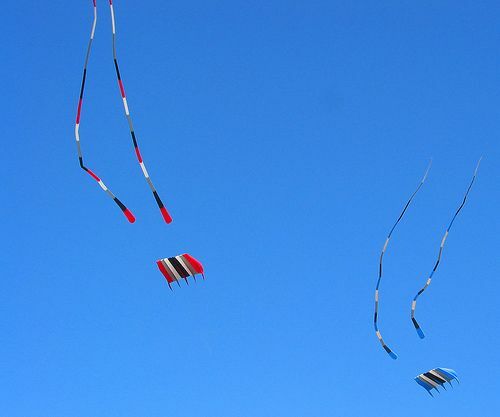 These parafoil kites are efficient and durable, with a solid amount of pull for their size. Very little space is taken up when they are rolled up and put away. A great close-up of a 2 line power kite in flight. It looks a little like a paraglider, not only in shape but also in color-scheme. You can clearly see the individual cells running from front to back. The multiple bridle lines on each side, and even a few meters of the 2 flying lines can be seen against the dark gray cloudy background. This kite could probably be used to pull something along on wheels, such as a mountain board, or just flown as an over-grown stunt kite. Plenty of fun to be had either way! 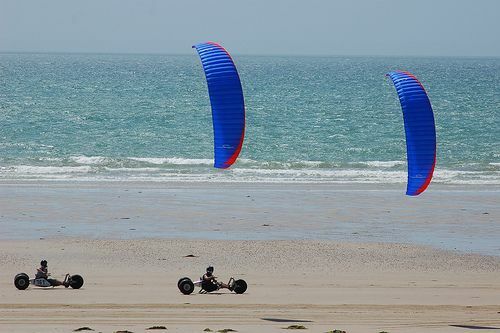 Nice photo of 4-line traction kites pulling two 3-wheeler kite buggies on a sandy beach. The guy on the right seems to have a little tension on the brake lines of his kite. 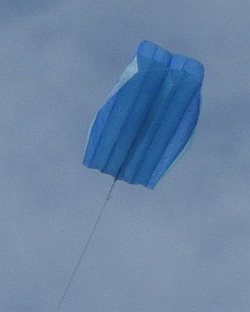 Look closely at the trailing edge, near the small white logo at the top end of the kite. See how the blue material is sloping down like an aircraft flap... I guess these parafoil kites are 'flying in formation'! What a great photo this is! It really captures the feel of harnessing wind power while traveling along on a 4-wheeler land board. Sometimes called a mountain board since they can also be used for skating down steep terrain like snow-boarders do. See how most of the work is done with those top 2 lines. The bottom 2 are used from time to time to brake the kite, or for finer steering control. That's about it for this photographic overview of parafoil kites. Maybe you will recognize some of these types next time you attend a kite festival or similar event. The smaller ones are mass-produced and can be quite cheap. 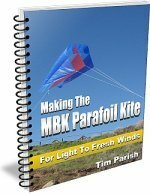 Have a look at Making The MBK Parafoil Kite if you would like to make and fly one yourself, from my e-book instructions. The e-book is a PDF file download, from which it's easy to get print-outs.